SAFETY NOTE: Please do not attempt to recreate the experiments shown on this page unless you are familiar with High Voltage Safety Techniques! Direct Current even above 60V maybe lethal even when the AC supply voltage has been disconnected due to the stored energy in the capacitors. I wanted to build a reliable high voltage DC supply for some cathode ray and simple particle accelerator experiments I am planning and here is where I'm up to so far. A voltage multiplier also sometimes called a Cockcroft–Walton Generator or Villard Cascade is a circuit that converts AC or RF power from a lower voltage to a higher DC voltage using a network of capacitors and diodes. A single secondary winding HV transformer is the most easily accessible and so I experimented with a few different variations finding that using two cascades of opposite polarity at the same time gave better results than a single long cascade. The next challenge has been the high voltage AC Supply to drive the voltage multiplier and the best candidate for this seemed to be a resonate fly-back inverter the type that many people use for Plasma balls and Kirlian photography as the circuit is quite simple and doesn't require a very heavy mains transformer due to the high frequency used. 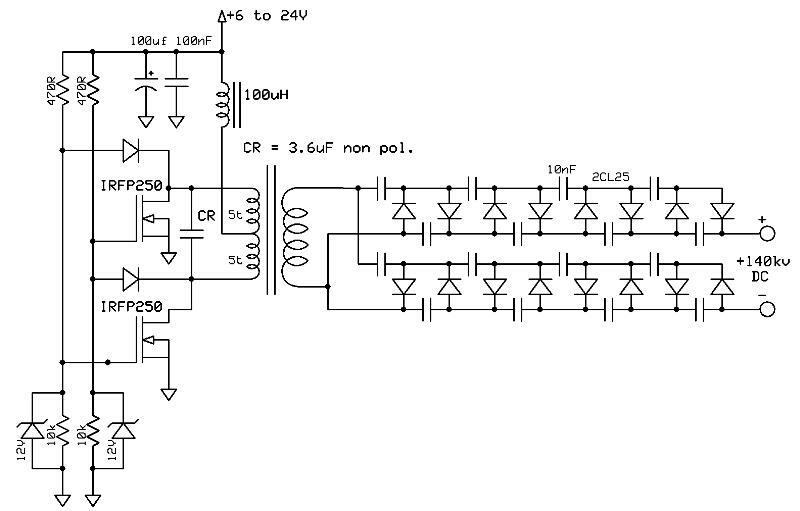 After some experimentation with different circuits I found that the impedance of the Flyback Transformer, the load and the value of CR where critical and I am now thinking resonate fly-back inverter disign is not the best, but the below circuit does work to give me approximately 140kv at 20V DC in. The next circuit I tried was a Mosfet resonate based design called the Vladimro Mazzilli Inverter this circuit is very effective and can easily burn out your secondary HV winding if not well insulated.